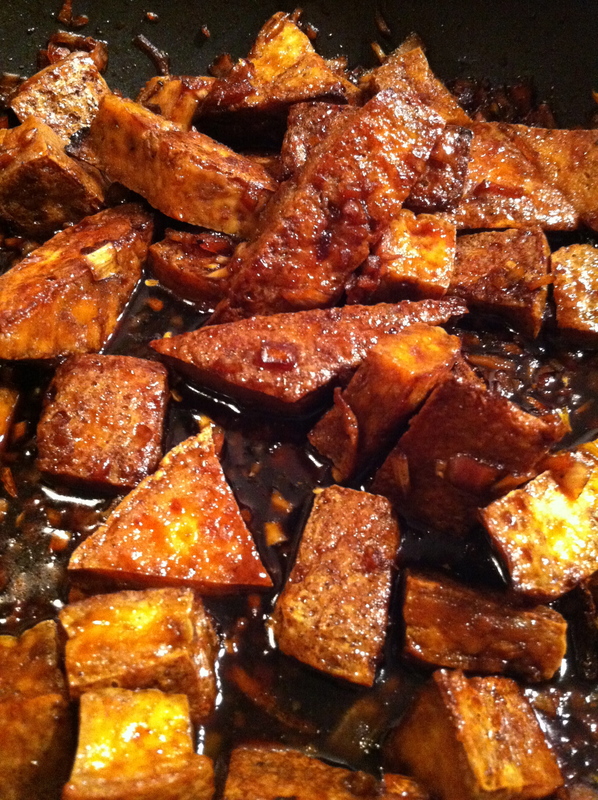 For dinner tonight I’m making Vietnamese Caramelized Tofu from this recipe. C lives firmly in the MEAT-IS-GOOD camp and it’s a little bit of a stretch to get him to eat (much less enjoy) Tofu. THANK GOODNESS he’s been a real sport about my experimentation. This recipe actually was quite nice. 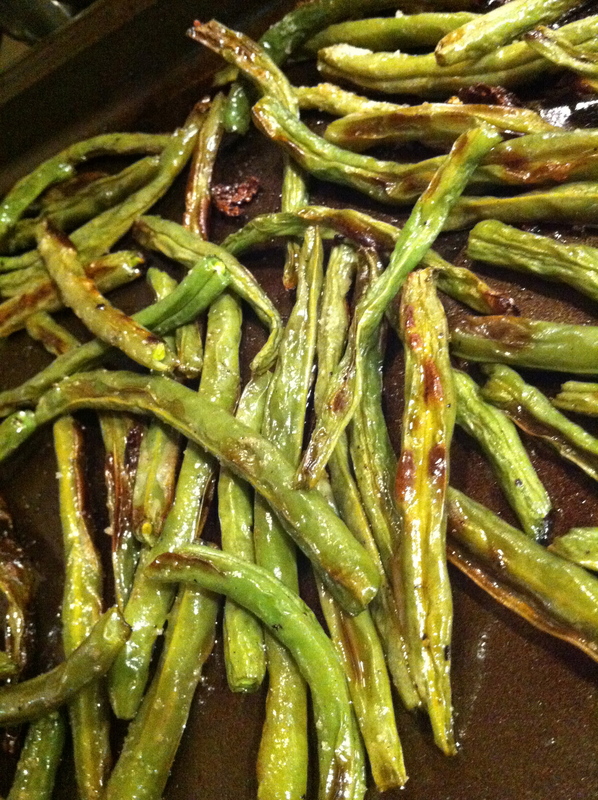 I served it over rice with roasted green beans (the best food ON EARTH). Here is the Tofu solo. I cut it into cute shapes. Just because. Here is the lovely combination – C had seconds and asked for extra sauce! Next time, I think I’ll try following the recipe as stated and use chicken. I think the crispiness of the chicken skin with the sweet-spiciness of the sauce would be lovely….. Maybe I’ll pick up some chicken at the market tomorrow….Hrmmmm…..
4 Chicken thighs, with bone and skin **I used 2 blocks of Extra Firm Tofu tonight for all the chicken pieces. 1. 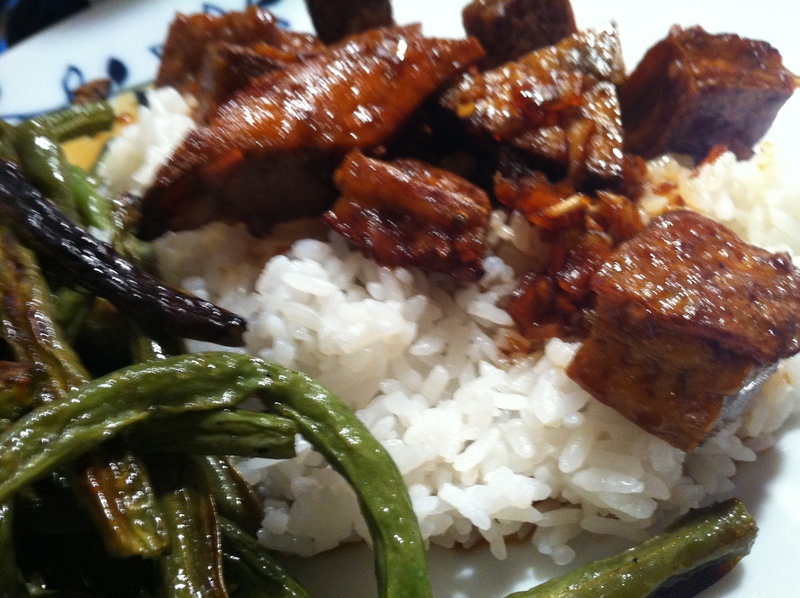 In a large bowl, whisk together the 1 tablespoon brown sugar, black pepper and 2 tablespoons soy sauce. Add the chicken (or tofu), toss to coat, cover and let sit for 30 minutes. Mix the onions, ginger, garlic, half the scallions and Thai chilis in a small bowl and set aside. 2. Once ready, pour both the sugars into a medium skillet over medium high heat and cook until they both begin to mix and melt, approximately 3-5 minutes. Pour 1/3 cup of water, the fish sauce and rice vinegar, along with the onions, ginger, garlic and Thai chilis. Cook another 5-7 minutes or until the sauce just begins to reduce, then remove from heat. 3. In a separate, larger skillet, heat a swirl of canola oil with the 1/2 teaspoon sugar over medium high heat. Once hot, add the chicken (tofu) and sear on both sides, approximately 2 minutes per side, making sure the skin has sufficiently browned. 4. Pour half of the sauce in with the chicken (tofu) and cook until it reduces by half. Turn the chicken (tofu) over and add the remaining sauce. Cover and cook another 20-25 minutes or until done, basting the chicken (tofu) occasionally and turning as necessary. 5. Garnish the chicken (tofu) with the remaining scallions once done.